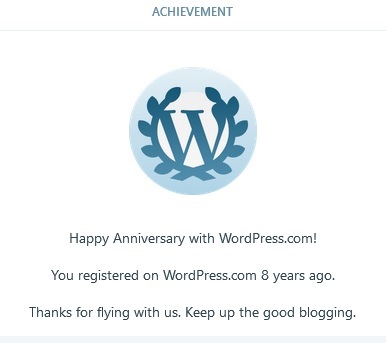 Oh haaai, happy wordpress-versary to me. It’s been EIGHT WHOLE YEARS OH MY ALLAH! I mean, that’s a lot. I just saw this notification and felt compelled to write a post. How much I have changed in these years and so has this blog and my relation with it. The PEOPLE, most of all. They were all such stories. I don’t know, it was different back then of course. My current state is somewhat like my last post. My current hobbies are different than the old ones. Today I talked with a friend and after so long felt so free to speak whatever I had in mind, zero filters. I really needed that. It felt liberating even when I was being so vulnerably weak-ish. It is important, I guess, to have someone listen. She was very surprised to hear that I don’t read books anymore. I don’t know, it doesn’t feel that bad to me. I’ve accepted it. I can’t. I wrote a darkish story after a long long while and I’m so glad I did. I had stopped doing that COMPLETELY after two ridiculous comments. That was liberating too. Yep that’s all. End of weird post. Who still blogs? so many of poems got lost because of this … once that train of thought is broken it’s almost impossible to reach that same state of emotion and mindset. You get inspired and then you cannot find the pen and paper and if you happen to find one … someone calls and breaks it. I know, I understand this. But please complete just that one this month! I know Yaar and I really do wanted to complete it for you. The other day I sat down for more than an hour, couldn’t write a single line. You know how the words they become like a flow. Everything I wrote felt forced not how the words just naturally fall after each other! Give it another chance some other time. True! Matlab kitnay tou masterpieces aisy hi neend ke nazar bhi hojatay hain :p Or otherwise baad me wo cheez aisi nahi lagti jiske peechay bhaga jaye. The amount of things I’ve lost like that is SO high. This is kinda sorta my story as well. Sigh. Happy anniversary! Sigh x2. Also, thanks man! You’re welcome. Be well, always. SubhanAllah eight years is alot! MashaAllah MashaAllah congrats! ❤ When I think of my blog, I always think of you. it’s up to your expectations a little bit.